4º H 4(2) Art. BS. A three-storey beehive to the design of Christopher Wren. Inspired by a transparent hive mentioned in Pliny, this design had a number of glass observation panels through which an observer could watch the movement of honey inside. Catalogue no. 65, p.52. During the early 1650s, one of the projects for improvement which interested many of Hartlib’s correspondents was the promotion of beekeeping. Inspired by the profits reported by West Indian planters, who had recently begun to cultivate cane sugar, Hartlib and his friends, including members of the Council of Trade, looked for ways ‘to turne England into Barbados’ (as Benjamin Worsley put it, Hartlib Papers, 28/2/2B [Ephemerides, 1651]). Hartlib hoped that, by encouraging beekeeping, it would be possible to produce cheaper and more plentiful honey, which could substitute for expensive sugar, as well as being used as a food and in brewing. Consequently, he consulted his correspondents for information about bees and their habits, drawing on a wide range of contacts both in England and on the Continent. In 1655, Hartlib published the results of his enquiries, in The Reformed Common-Wealth of Bees. This work included a contribution from Arnold Boate, on the generation of bees, as well as pieces by other members of the Hartlib circle. In particular, it printed several letters detailing new designs of beehive, of which the most striking was the transparent beehive developed by William Mewe, a Gloucestershire clergyman, following a model mentioned in Pliny. Mewe’s invention had been further modified by John Wilkins and his young protégé, Christopher Wren (see catalogue nos.18 and 60 ). 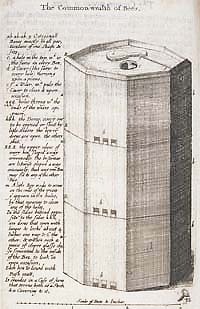 Hartlib illustrated Wren’s design, executed in May 1654, for a three-storey, transparent beehive. The bees were able to move between the various layers of the hive, and glass panels set into the structure allowed an observer to see the honey cascading down inside it. Although Wren’s construction had not been an immediate success (due to a failure to realise that bees worked downwards), it offered the prospect of an ever-increasing stock of bees and honey within the same hive. Sir Cheney Culpeper was enthusiastic about the possibilities of transparent hives, ‘wherein the whole waye of woorkinge of that little creature might be seene; by which wee might (I am confidente) haue vnsophisticated wines of our owne, cheaper & better then from other nations’ (Braddick and Greengrass, p.363). Hartlib hoped that The Reformed Common-Wealth of Bees and the beehives which he promoted would receive official patronage, and he planned to present them to members of the Committee for Trade and Foreign Affairs. However, his schemes for increased production, and for the replacement of sugar with English honey and wine with mead, came to very little. Nevertheless, there remained lessons to be learned from the bees. Hartlib’s interest in them had never been purely economic, since the ordered activity of the hive provided a model of pious industry and good husbandry. Through the activities of virtuous improvers, this, at least, might be replicated in the human commonwealth. G.E. Fussell, The Old English Farming Books from Fitzherbert to Tull 1523–1730 (London, 1947), p.47; Timothy Raylor, ‘Samuel Hartlib and the Commonwealth of Bees’, in Michael Leslie and Timothy Raylor (eds. ), Culture and Cultivation in Early Modern England (Leicester, 1992), pp.91–129; M. J. Braddick and Mark Greengrass (eds. ), ‘The Letters of Sir Cheney Culpeper, 1641–1657’, pp.105–402 in Camden Miscellany XXXIII (Camden Society, Fifth Series, vol.7, 1996), p.362–3; Hartlib Papers, 28/2/2B, 25/9/2A–2B, 33/1/23A–24B, 70/6/1A–2B.